Residents of the Capital Governate can get a complete health checkup at Yarmouk Clinic; including physical examination and all other required lab tests. I think it’s a great idea. A lot of diseases can be easily treated if caught early. I know some of you might prefer private clinics, but I for one prefer the public hospitals and doctors; which means I probably will call and set up an appointment at Yarmouk. The clinic is open on Sundays for women, and on Wednesdays for men; from 5-9 p.m.. And in ramadan, it’ll be open from 8-11 p.m. Call on 2533 6482 ext. 165 to make an appointment. June 14 is the World Blood Donor Day, it was the day the ABO blood group system was discovered. It was a very important discovery, one that won the Nobel Prize in Medicine. 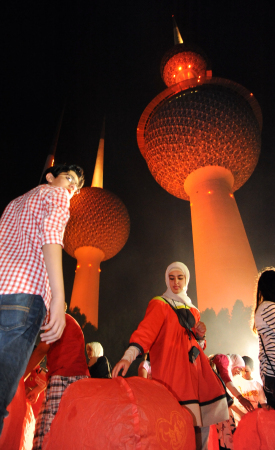 Kuwait is celebrating it by dressing Kuwait Towers in red for a full month. If you remember, Kuwait Towers were also dressed in Pink, in support of Breast Cancer Awareness back in Oct. of last year. بدورها أكدت مراقب الخدمات الطبية والتوجيه في بنك الدم مؤسس نادي 25 التطوعي د. رنا العبدالرزاق أنه سيتم اليوم السبت تلوين مجمع الافنيوز باللون الاحمر وافتتاح مقر نادي 25 هناك والذي سيستمر خلال فترة الصيف لتنظيم حملات التبرع بالدم وانشطة متنوعة. I got a BBM yesterday afternoon asking us to pray for our Sh., and that he’s sick with the flu and that he’ll be admitted to the Military Hospital for treatment. 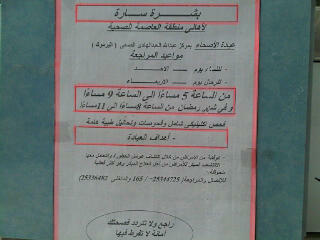 The BBM didn’t mention Sh. Sabah by name, I asked around and no one heard that he was sick, so I just assumed that it was a wrong BBM originally intended for someone else in the Gulf. However, it sadly turned out to be true. Our beloved Sh. Sabah has been sick with the common cold. Thank god it’s just a cold, everybody’s getting sick with it these days,and staying sick for weeks. Thank god it’s not something serious.